Stamped on bell: [Shield with azure ground, surmounted by coronet, supported by six swords with drapery] / Guichard Breveté, / A PARIS ; FA stamped on diamond-shaped German-silver plate on receiver; B stamped on receiver ferrule. Four-piece, double-loop brass body with tuning slide on second bow; no shank/crook required. Overlapping tab seam with gusset (width of tabs 2 mm at a distance of 12 mm). French rim, iron wire insert. Ferrules with engraved and impressed lines in groups of two. Two early model Stölzel valves lower the pitch a whole tone (first valve) and a semitone (second valve). Valves aligned by horizontal guide pin screwed into slots in piston. Mother-of-pearl touchpieces pieces (replacements). Internal slide tubing. Windway: second valve, first valve. Accessories: Silver mouthpiece stamped 21. Sounding length: 1786 mm; internal diameter receiver: 11.5 mm; internal diameter receiver minimum (at 19 mm): 11.2 mm; bore diameter: 11.5 mm (inner valve slides); bell diameter: 138 mm. 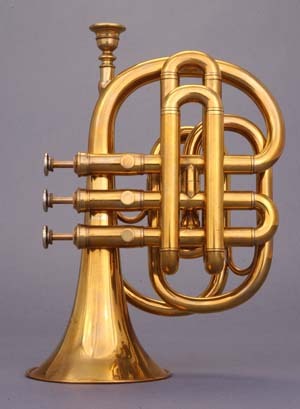 This same model is depicted in George Kastner's Manuel gènèral de musique militaire (Paris 1848), as trompette à deux pistons. The valves resemble Heinrich Stölzel's original type with a horizontal alignment guide pin screwed into the upper part of the valve casing to guide the piston and stop the return spring. 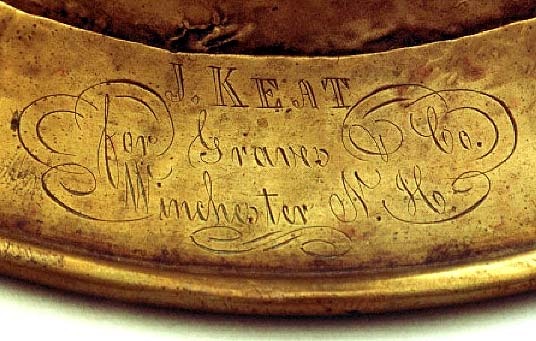 Engraved on garland: J. KEAT / for Graves & Co. / Winchester N. H.; FBBF 6 engraved on inner slide of first valve. Four-piece, double-loop brass body with tuning slide on second bow; no shank/crook required. Overlapping tab seam (width of tabs 2.5 mm at a distance of 2.5 mm). Saxon rim, iron wire insert. Undecorated garland with straight upper edge. Ferrules without decoration. Two later model Stölzel valves lower the pitch a whole tone (first valve) and a semitone (second valve). Spring enclosed in barrel; guide pin alignment of piston. German-silver touchpieces pieces. External slide tubing. Windway: second valve, first valve. Sounding length: 1797 mm; internal diameter receiver: 12 mm; internal diameter receiver minimum (at 75 mm): 11 mm; bore diameter: 11 mm (inner valve slides); bell diameter: 116 mm. James Keat, the third son of Samuel Keat, the well-known London brass instrument maker, emigrated to the United States. In 1837, he purchased part of the building occupied by the woodwind maker, Graves & Co., in Winchester, New Hampshire, where he subsequently worked on commission for Graves. This model combines the typically English sloping leadpipe with the Continental Stölzel valves of the later type. Lit. : Sabine Klaus, "Trumpet in F by James Keat," International Trumpet Guild Journal, Vol. 28, No. 1 (October 2003), p. 76. Stamped on bell: [leaf?] / MÜLLER / BREVETE / A / LYON / [leaf?]. 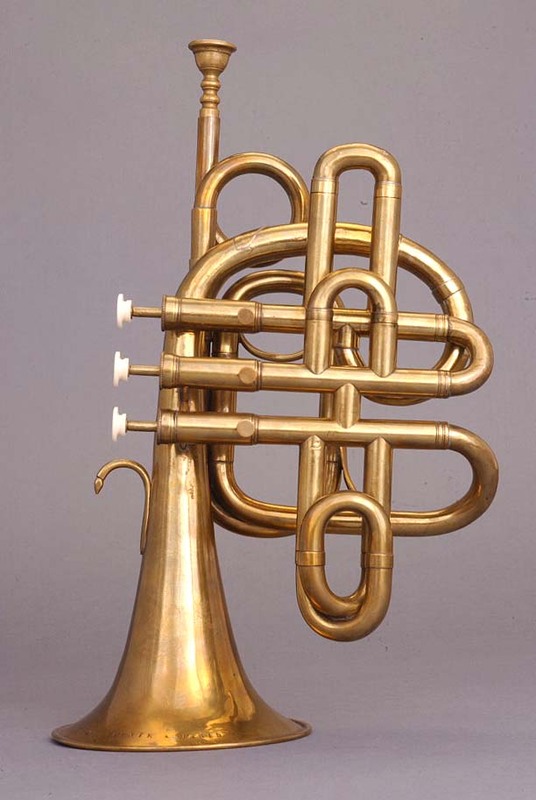 Four-piece, single-loop brass body with additional coil between second valve and bell; tuning slide at leadpipe (can be extended to A); dummy tube substituting for apparent large first bow. Overlapping tab seam (width of tabs 2 mm at a distance of 2 mm). French rim with iron wire insert. Brass ferrules with one engraved line adjacent to the edge. Three early model Stölzel valves in normal order. Valves aligned by horizontal guide pin screwed into valve casing and passing through slots in piston. Mother-of-pearl touchpieces pieces with beaded brass base. First and third valves external slide tubing; second valve internal slide tubing. Windway: third, first, second valve. Accessories: Probably original brass mouthpiece (deep and almost funnel-shaped); telescopic tuning slide; brown-stained wood case with brass fittings and green felt interior; brass lyre. Sounding length: 1295 mm (including inserted tuning slide); internal diameter receiver: 12.9 mm; bore diameter: 12.1 mm (inner valve slides); internal diameter receiver tuning slide: 12.5 mm; internal diameter receiver tuning slide minimum (at 15 mm): 12.1 mm; bell diameter: 134 mm. 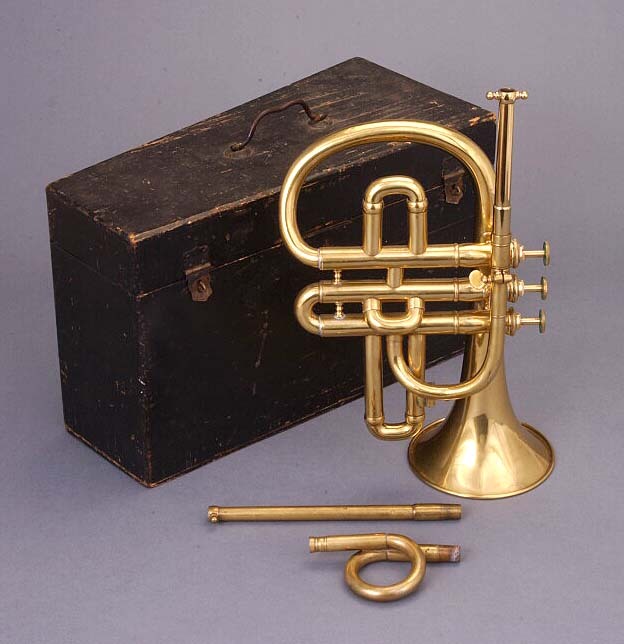 This early bugle à piston or flugelhorn closely resembles its ancestor, the keyed bugle, particularly in the shape of the bell. Louis Müller (d. 1867) transferred cornet à piston design features, like the Stölzel valve, to a bugle à piston with wide bore. Stamped on garland: KEY / 20 CHARING CROSS / LONDON. 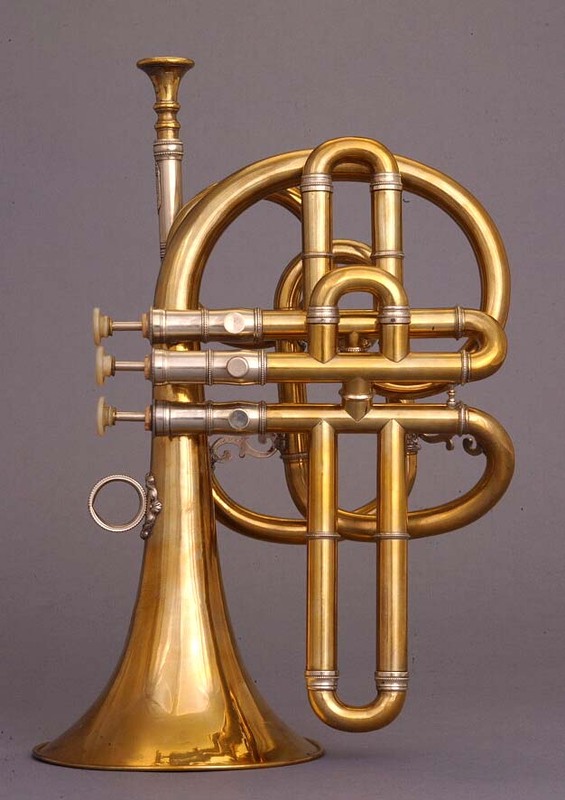 Four-piece, double-loop brass body with tuning slide at second bow; shank/crook required. Overlapping tab seam (width of tabs ca. 3 mm at a distance of ca. 3 mm). Saxon rim with iron wire insert. Brass ferrules without decoration. Three later model Stölzel valves in reversed order (semitone, whole tone, minor third). Spring enclosed in barrel; alignment by key on spring barrel fitting in notch of valve casing. touchpieces pieces silver-plated. First valve inner moving slides, second and third valve outer moving slides. Windway: third, second, first valve. One clapper (trill) key for the left hand. Round, flat key head lined with cork. Brass tone hole rim soldered to body. Key pivots on brass screw in rectangular saddle; brass leaf spring. Accessories: Three brass mouthpieces with flat silver rim; three tuning shanks engraved B , A and E. on F Crook (coupler); seven crooks engraved C. Octave. (inserted into tuning slide, bypassing leadpipe), A , G, F, E , D on E (coupler), and D on E (coupler). Black wood case with woven green felt interior. All parts original; in addition, one later tuning shank. Sounding length: 1282 mm (B-flat), 1345 mm (A), 1435 mm (A-flat), 1552 mm (G), 1757 mm (F), 1847 mm (E), 1901 mm (E-flat), 2045 mm (D), 2116 mm (D-flat); internal diameter receiver: 12.1 mm; internal diameter minimum (at 32 mm): 11 mm; bore diameter: 11.3 mm (inner valve slides); internal diameter receiver shanks and crooks: 10.7 mm; bell diameter: 117 mm. This instrument shows two unusual features: First, the valves are in reversed order--semi-tone, whole tone, minor third--instead of having the whole tone first. This sequence was rather common in Bavaria until the early 20th century, but is only occasionally found on the British Isles. Second, the C-octave crook shortens the overall tube length instead of lengthening it. This is achieved by insertion into the tuning slide rather than the leadpipe, which is bypassed when the C crook is in use. Such a construction is known for invention horns since 1776, when it was first introduced by Gottfried Haltenhof in Hanau/Main, but it seldom occurs in early cornopeans. Lit. : Sabine Klaus, "The Utley Collection . . . New Jewels Include a Rare Keyed Trumpet by E. J. Bauer, Prague," National Music Museum Newsletter, Vol. 31, No. 1 (February 2004), p. 2. "Cornopean by Thomas Key in B-flat" in "Historical Instrument Window," Edward H. Tarr, editor, International Trumpet Guild Journal, Vol. 29, No. 3 (March 2005), p. 50. 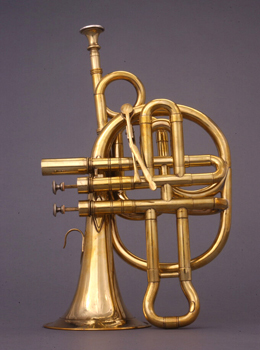 Four-piece, double-loop brass body with tuning slide on second bow; shank/crook required. Overlapping tab seam with gusset (width of tabs 2.5 mm at a distance of 10 mm). Variation of French rim with iron wire insert, in which the rim is attached separately (instead of being an integral part of the bell). Brass ferrules with two engraved lines. Two early model Stölzel valves lower the pitch a whole tone and a semitone. Valves aligned by horizontal guide pin screwed into slots in piston. Ivory touchpieces pieces. Internal slide tubing. Windway: second valve, first valve. Accessories: brass mouthpiece; brass tuning shank (probably not original). Sounding length: 1271 mm (with tuning shank); internal diameter receiver: 11.5 mm; internal diameter minimum (at 20 mm): 11.2 mm; bore diameter: 11.6 mm (inner valve slides); internal diameter receiver tuning shank: 9.4 mm; bell diameter: 129 mm. 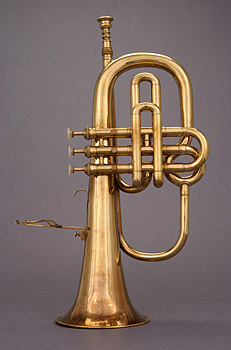 French-style cornopeans (cornet � deux pistons) such as this one were built by Parisian makers like Guichard and Halari. 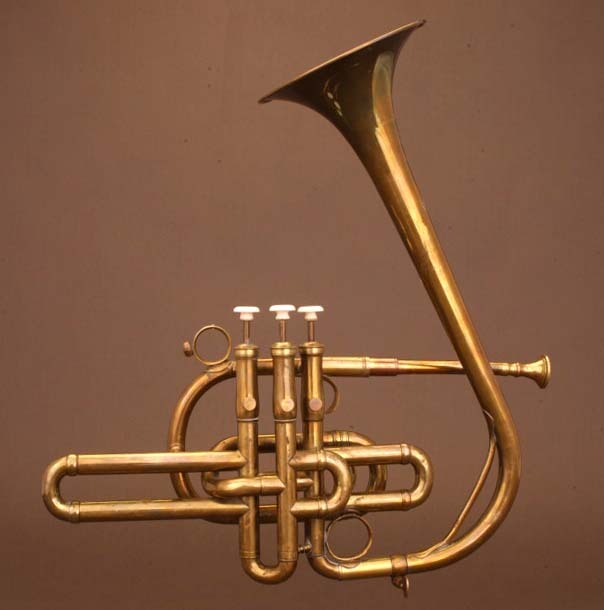 The tube arrangement is derived from the old Parisian trumpet (see NMM 7090). Lit. : Sabine K. Klaus, with contributions from Robert Pyle, "Measuring Sound: BIAS Aids Understanding of Brass Instruments," NMM Newsletter 37, No. 3 (December 2010). 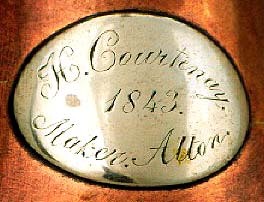 Engraved on oval silver plaque on bell: H. Courtenay. / 1843. / Maker. Alton. Four-piece, double-loop copper-alloy body with tuning slide on second bow; shank/crook required. Overlapping tab seam (width of tabs 10 mm at a distance of 10 mm), flaring part attached separately. Saxon rim, probably with brass wire insert. Brass ferrules without decoration. Three later model Stölzel valves in normal order. Spring enclosed in barrel; guide pin alignment of piston. German-silver touchpieces pieces. First valve closer to bell than second and third valve. Internal slide tubing. Windway: first, second, third valve. One clapper (trill) key of brass for the left hand. Round, flat key head with white felt pad (replacement). Copper tone-hole rim soldered to body; key pivots on iron pin in tube on two brass posts; brass leaf spring. Accessories: Brass mouthpiece; brass crook stamped LAB (not original). Sounding length: 1442 mm (A-flat); internal diameter receiver: 11.8 mm; internal diameter minimum (at 24 mm): 10.8 mm; bore diameter: 10.8 mm (inner valve slides); internal diameter receiver crook: 9.4 mm; bell diameter: 116 mm. Typical English cornopean with clapper key used to improve performance of trills. Although the "clapper shake key" was patented in France by George Macfarlane in 1845, Courtenay's instrument predates this patent. An even earlier example of a clapper key can be seen on a cornopean by Richard Garret, London, made between 1826 and 1834 (NMM 438). Henry Courtenay, born in 1820 in Fleet, England, is listed in Hampshire records as a mechanic and tin-plate worker. Lit. : Sabine K. Klaus, "Henry Courtenay (1820-1881) of Alton: His Life, His Cornopean, and Further Thoughts on the 'Clapper Shake Key,'" The Galpin Society Journal, Vol. 59 (May 2006), pp. 101-115. Four-piece, double-loop brass body with tuning slide on second bow; shank/crook required. Overlapping tab seam (width of tabs 5 mm at a distance of 5 mm). Undecorated, narrow brass garland with plain upper edge. Saxon rim with iron wire insert. Brass ferrules with two engraved engraved lines. Three later model Stölzel valves in normal order. Spring enclosed in barrel; guide pin alignment of piston. Brass touchpieces pieces with brass protection caps. External slide tubing. Windway: first, second, third valve. One clapper (trill) key of brass for the left hand. Round, flat key head with brown leather pad (probably original). Brass tone-hole rim soldered to body; key pivots on iron screw in tube on two brass posts; brass leaf spring. Accessories: Three presumably original, unstamped crooks and two tuning shanks of brass; black wood case with original green cloth lining (faded). Sounding length: 1300 mm (B-flat), 1374 mm (A), 1435 mm (A-flat), 1537 mm (G), 1725 mm (F); internal diameter receiver: 12.1 mm; internal diameter minimum (at 54 mm): 11.5 mm; bore diameter: 11.5 mm (inner valve slides); internal diameter receiver crooks and tuning bits: 11.7 mm; bell diameter: 127 mm. Typical English cornopean with clapper key. Metzler & Co., established in London in 1833, both made and dealt in brass and woodwind instruments. Stamped on bell: RAOUX SEUL FOURNISSEUR DU ROI RUE SERPENTE A PARIS; oval impression on bell above signature: AR; serial number 292 stamped on bell on opposite side of signature. 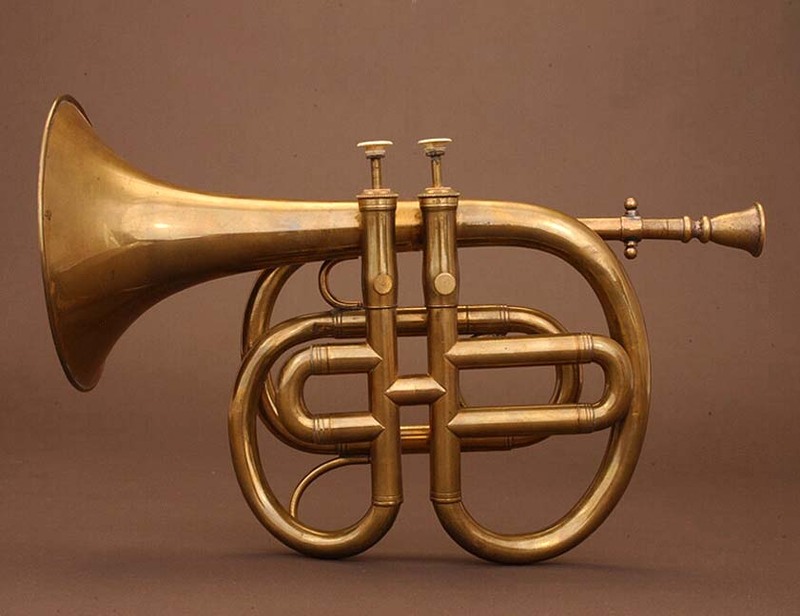 Four-piece, double-loop brass body with tuning slide on second bow; shank/crook required. Overlapping tab seam (width of tabs 2.5 mm at a distance of 2.5 mm). Variation of French rim with brass wire insert, bell rim bent inward. Brass ferrules with one engraved line adjacent to the edge. Three early model Stölzel valves in normal order. Valves aligned by horizontal guide pin screwed into slots in piston. Ivory touchpieces pieces (replacements). Internal slide tubing. Windway: third, second, first valve. Accessories: Brass mouthpiece; three tuning shanks stamped on silver plates S B (B-flat), R (D, used as coupler) and L (A); five crooks stamped L B (A-flat), S (G), F (F), M (E) and M B (E-flat); wood case with red leather interior; cleaning tool with wood knob. All parts presumably original. Sounding length: 1355 mm (B-flat), 1449 mm (A), 1528 mm (A-flat), 1633 mm (G), 1831 mm (F), 1936 mm (E), 2035 mm (E-flat), 2174 mm (D, E-flat crook and D coupler shank); internal diameter receiver: 11.2 mm; internal diameter minimum (at 35 mm): 10 mm; bore diameter: 11.2 mm (inner valve slides); internal diameter receiver crooks and tuning shanks: 9.5 mm; bell diameter: 120 mm. Marcel Auguste Raoux was one of the leading Parisian brass makers of his time. He was most famous for horn production, but also displayed cornets and ophicleides in the Paris exhibition of 1844. 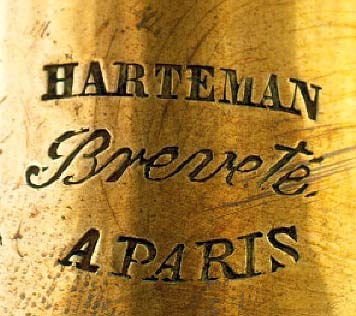 Stamped on bell: HARTEMAN / Breveté, / A PARIS; P engraved inside receiver ferrule. Four-piece, double-loop brass body with tuning slide on second bow; shank/crook required. Overlapping tab seam with gusset (width of tabs 2 mm at a distance of 8 mm). French rim with iron wire insert. Silver ferrules, decorated with beading, and engraved and impressed lines. Highly decorative silver braces and finger ring on floral mounts. Three early model Stölzel valves in normal order. Valves aligned by horizontal guide pin screwed into slots in piston. Mother-of-pearl touchpieces pieces arranged in a triangle. Internal slide tubing. Windway: third, second, first valve. Accessories: Brass mouthpiece; tuning shank stamped LA (A), four crooks stamped SOL (G), FA (F), MI (E) and MIB (E-flat), the latter being a coupler, all stamps on decorated silver plates; further, one tuning shank stamped SB (B-flat) and one crook stamped L.b (A-flat), not original; black wood case with leather interior. Sounding length: 1473 mm (A), 1646 mm (G), 1840 mm (F), 1942 mm (E), 2061 (E-flat, F crook and coupler), 2163 mm (D, E crook and coupler); internal diameter receiver: 11.5 mm; internal diameter minimum (at 31 mm): 11.4 mm; bore diameter: 11.4 mm (inner valve slides); internal diameter receiver crooks and tuning shank: 9.6 mm; bell diameter: 127 mm. Although nothing is known about Harteman's life, a horn, a trumpet, and an ophicleide bearing his name are preserved, in addition to this cornopean, suggesting that he was a highly skilled maker. 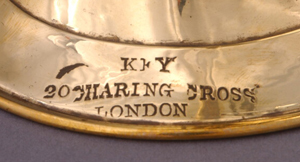 Stamped on bell: [royal coat of arms with crown, lion, and unicorn] / PASK & KOENIG / MAKERS / LONDON / 2909; upper valve casings and pistons stamped 7 (first valve), 8 (second valve), and 36 (third valve). Four-piece, triple-loop brass body with tuning slide on second bow; no shank/crook required. Overlapping tab seam (width of tabs 3.5 mm at a distance of 3.5 mm). French rim, iron wire insert. Brass ferrules with one engraved line adjacent to the edge. Three early model Stölzel valves in normal order. Valves aligned by horizontal guide pin screwed into slots in piston. German-silver touchpieces pieces. Internal slide tubing. Windway: third, second, first valve. Accessories: Brass mouthpiece; black case with red cloth interior. Sounding length: 1325 mm; internal diameter receiver: 9.7 mm; internal diameter receiver minimum (at 34 mm): 8.8 mm; bore diameter: 10.8 mm (inner valve slides); bell diameter: 97 mm. 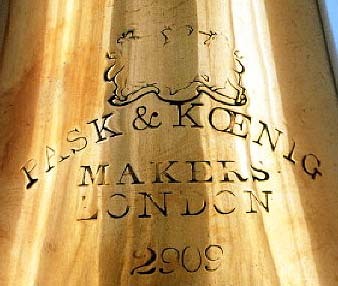 The firm, Pask & Koenig, existed only between 1849 and 1851. Although they called themselves "makers" in the signature, they only dealt in musical instruments. 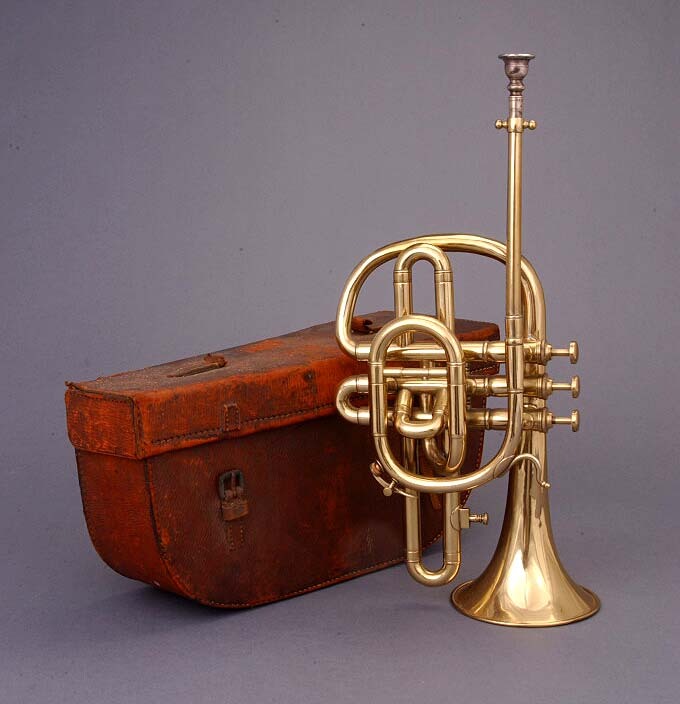 Therefore, this pocket cornet might be of French origin, since it exhibits characteristics of the Parisian-style cornet à pistons. Herman Koenig was a famous cornet player who toured the United States in 1853 with the Louis Jullien Orchestra. 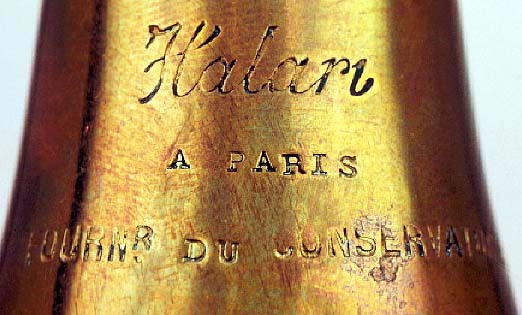 Stamped on bell: Halari / A PARIS / FOURNR. 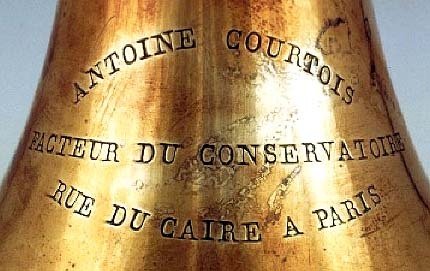 DU CONSERVATOIRE; C stamped on leadpipe ferrule. 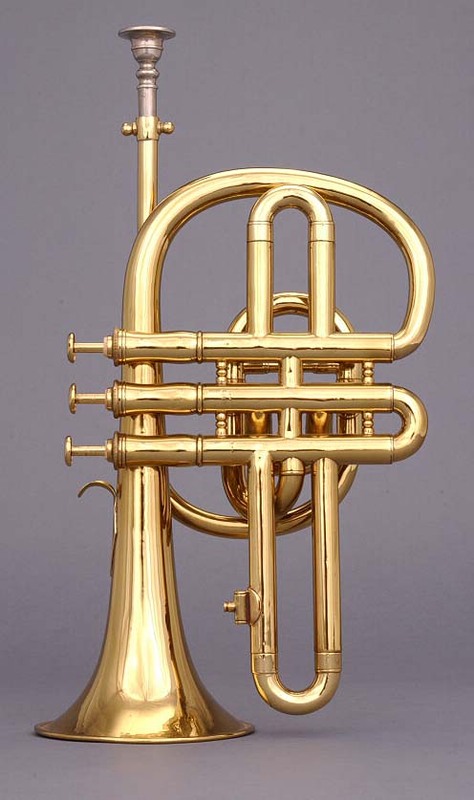 Five-piece, double-loop brass body with tuning slide on second bow and detachable, rotating bell pointing upwards or sidewards; shank/crook required. Overlapping tab seam (width of tabs 2 mm at a distance of 50 mm). French rim, iron wire insert. Ferrules with one to three engraved lines. Three early model Stölzel valves in normal order. Valves aligned by horizontal guide pin screwed into slots in piston. Ivory touchpieces pieces arranged in a triangle. Internal slide tubing. Windway: second, third, first valve. 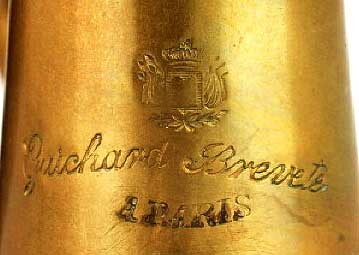 Accessories: Two brass mouthpieces: one unsigned, the other one stamped [EM]BOUCHURE RAYEL / [H? ]UILBAUT / BTE S.G.D.G. / COUESNON & C. / PARIS / No 2, with star shaped throat; two brass tuning shanks stamped SI B and LA; five crooks stamped LA B, SOL, FA, MI and MI B; black wood case with blue cloth interior (replacement). Sounding length: 1361 mm (B-flat), 1431 mm (A), 1518 mm (A-flat), 1601 mm (G), 1821 mm (F), 1931 mm (E), 2021 mm (E-flat); internal diameter receiver: 12.8 m;, internal diameter minimum (at 54 mm): 11 mm; bore diameter: 11.4 mm (inner valve slides); internal diameter receiver crooks: 8.8 mm; bell diameter: 120 mm. Cornopeans with rotating, upright bells were sometimes called cavalry cornets. 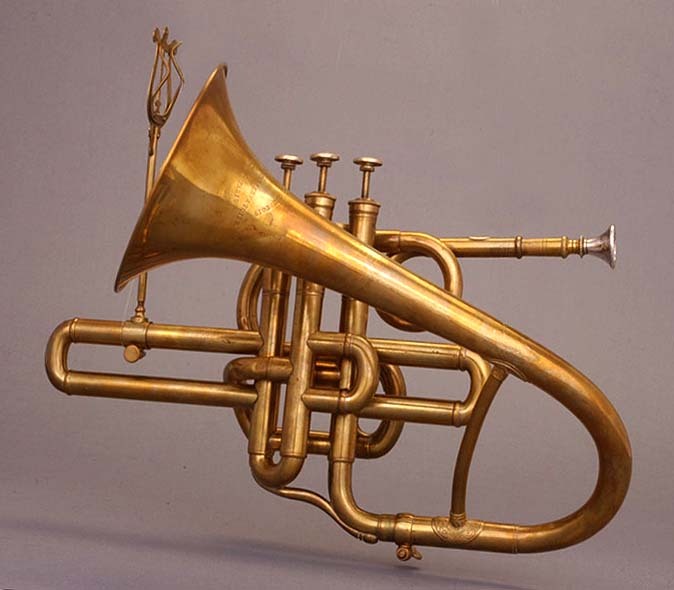 They had a certain popularity among Parisian makers in the nineteenth century and predate instruments of this shape made popular in the twentieth century by Dizzy Gillespie. Stamped on bell: ANTOINE COURTOIS / FACTEUR DU CONSERVATOIRE / RUE DU CAIRE A PARIS; serial number 988 stamped inside third valve cap; upper valve cases, caps (inside), and spring barrels stamped 1 (first valve), 2 (second valve), and 3 (third valve). Five-piece, S-shaped brass body with tuning slide on second bow and detachable, rotating bell; shank/crook required. Overlapping tab seam with gusset (width of tabs 2 mm at a distance of 12 mm). French rim with iron wire insert. Brass ferrules with one engraved line adjacent to the edge. Three later model Stölzel valves in normal order. Spring enclosed in barrel; guide pin alignment of piston. German-silver touchpieces pieces (presumably replacements). Internal slide tubing. Windway: second, third, first valve. Accessories: Two mouthpieces with silver-plated cups; one brass tuning shank stamped UT (c); two similar unstamped brass coupler bits; four brass crooks stamped LA (A), LA I (A-flat), SOL (G), FA (F), and one coupler crook (all presumably original); one brass crook stamped LAB on oval German-silver plaque (presumably not original); extra tuning slide for the second valve; wood case with mahogany veneer and inlay of fine strip of light wood, red leather interior; brass music lyre. Sounding length: 1155 mm (c), 1186 mm (B, shorter coupler bit with c shank), 1306 mm (B-flat, both coupler bits with c shank), 1396 mm (A), 1481 mm (A-flat), 1576 mm (G), 1776 mm (F), 1921 mm (E, coupler and A-flat crook), 2016 mm (E-flat, coupler and G crook); internal diameter receiver: 12.1 mm; internal diameter minimum (at 35 mm): 10.4 mm; bore diameter: 11.5 mm (inner valve slides); internal diameter receiver crooks and tuning bits: 9.6 mm; bell diameter: 123 mm. The dating of this cornopean is based on the fact that Antoine Courtois' shop was located on the Rue Caire from 1844 to 1856. Compared to Halari's instrument (NMM 7142), the detachable bell is set up at a lesser angle in relation to the leadpipe. Unsigned. Production number 6907 stamped on second valve casing, all three valve caps and the pistons; L.P. (low pitch) stamped on receiver ferrule of B-flat shank. 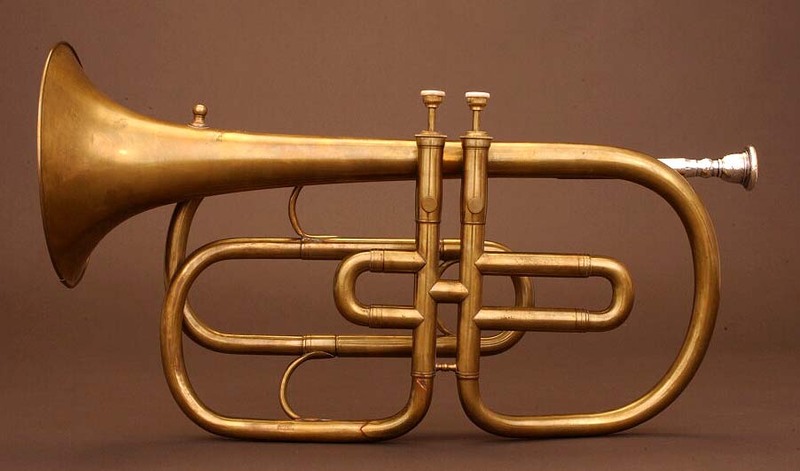 Four-piece, double-loop brass body with tuning slide on second bow; shank/crook required. Overlapping tab seam with gusset (width of tabs 1.5 mm at a distance of 20 mm). French rim, iron wire insert. Brass ferrules with one engraved line adjacent to the edge. Three later model Stölzel valves in normal order. Spring enclosed in barrel; guide pin alignment of piston. Right-handed. Brass touchpieces pieces. Internal slide tubing. Windway: third, second, first valve. Accessories: German-silver mouthpiece (not original); brass shank for B-flat (probably not original); old black leather case (not original). It is likely that this cornopean was originally equipped with many more shanks and crooks. Sounding length: 1281 mm (B-flat, including shank); internal diameter receiver: 12.1 mm; internal diameter receiver minimum (at 29 mm): 9.4 mm; bore diameter: 11.7 mm (inner valve slides); internal diameter receiver shank: 9.4 mm; bell diameter: 110 mm. 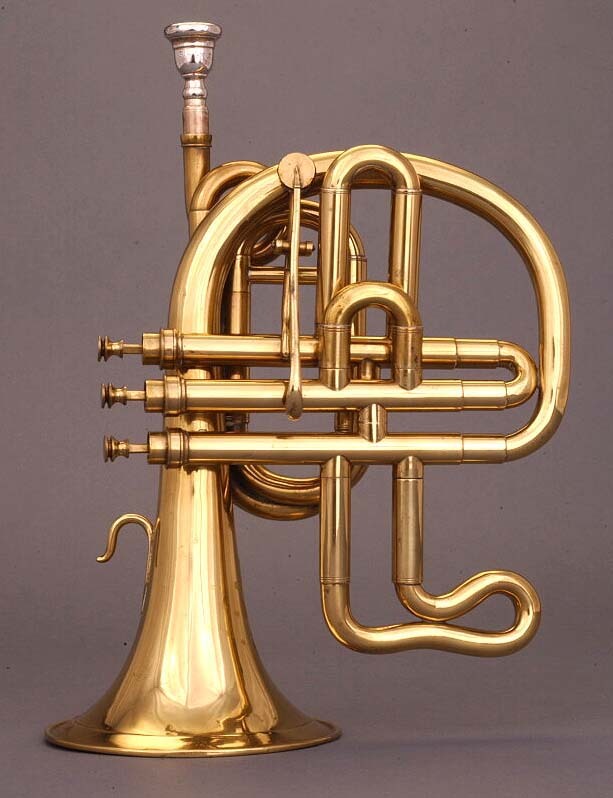 The country of origin of this instrument cannot be established with certainty because it is patterned after the widely copied Parisian cornet à pistons model. Unsigned. 1 (first valve), 2 / B (second valve), 3 / B (third valve) stamped on upper part of valve cases; L stamped on lower part of second valve case; 1 and 3 stamped on first and third valve caps, 4 4 4 stamped on second valve cap. Two-piece, single-loop brass body with straight, telescopic tuning slide at leadpipe, equipped with a wing-screw. Overlapping tab seam with gusset (width of tabs 1.5 mm at a distance of 17 mm). French rim with iron wire insert. Brass ferrules with one engraved line, shanks and crooks with one to three impressed lines, torus-shaped valve slide ferrules. Three later model Stölzel valves in normal order. Spring enclosed in barrel; guide pin alignment of piston. Brass touchpieces pieces. Internal slide tubing at first and third valves, second valve without slide. Windway: third, second, first valve. Accessories: Two tuning shanks for e-flat and d (probably not original); one crook stamped UT (probably original); black wood case with iron and brass fittings (probably original). Sounding length: 1166 mm (c, with crook), 1090 mm (d shank), 1021 mm (e-flat shank); internal diameter receiver: 11.3 mm; bore diameter: 11.8 mm (inner valve slides); internal diameter receiver c crook: 9.1 mm; bell diameter: 114 mm. Soprano cornet à pistons. The shape of the valve slides resembles those on signed instruments made by Gautrot aîné in Paris. Unsigned. X C stamped on lower part of second valve case (probably reference to model); 1 (first valve), 2 / 0 (second valve), and 3 (third valve) stamped on upper part of valve cases and valve caps; D A stamped on receiver. 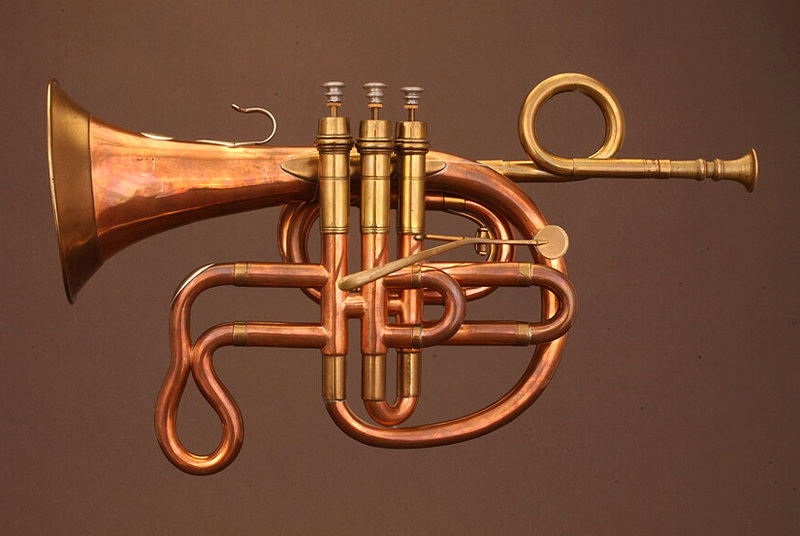 Four-piece, double-loop brass body with tuning slide on second bow; shank/crook required. Overlapping tab seam with gusset (width of tabs 2 mm at a distance of 25 mm). French rim with iron wire insert. Brass ferrules with one engraved line adjacent to each edge. Accessories: Silver mouthpiece engraved Leny and stamped DISTIN. LONDON; brass tuning shank stamped LA (presumably original); brown leather case with green cloth fitting inside (probably original). Additional shanks and crooks do not survive. Sounding length: 1366 mm (A); internal diameter receiver: 11.8 mm; internal diameter receiver minimum (at 36 mm): 9.7 mm; bore diameter: 11.9 mm (inner valve slides); internal diameter receiver shank: 9.1 mm; bell diameter: 116 mm. Parisian cornet à pistons model.